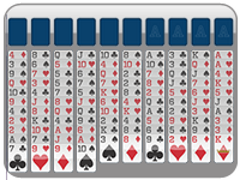 Welcome to the hardest variation of Free Cell Solitaiire, Baker's Game. Baker's Game was invented in 1968 by C.L. Baker, and like Free Cell, Baker's Game is an open game. Cards are dealt facing up in eight tableau piles. 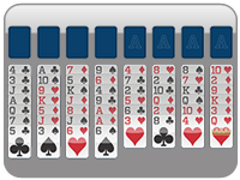 The goal of Baker's Game is to complete 4 card foundations following Ace to King. 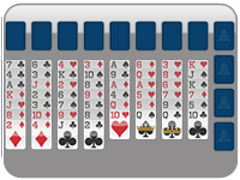 The four additional cells are used to store one card at a time. Cards within the cells can be moved either back to the tableaus or into the foundations. What sets Baker's Game apart from Free Cell is that tableau piles are built down by suit, rather than alternating colors. 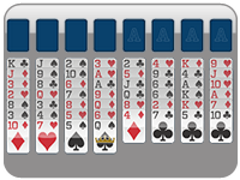 Baker's Game is a difficult card game, so do not get frustrated if you do not win immediately. Baker's Game takes earned skill, patience, and love for all things solitaire.